Along with her husband Sting, Trudie Styler founded the Rainforest Fund 25 years ago, and as a longtime advocate for the rights of the indigenous communities of the Amazon, she has supported the legal efforts to hold Chevron accountable for its human rights and environmental abuses in Ecuador. Today, Trudie posted a powerful article on Huffington Post. We encourage you to read and share this thoughtful piece. Thank you, Trudie. Let us begin with a common understanding; let's start with what is not in dispute. The Amazon rainforest is one of the world's most important ecosystems and is home to the largest remaining area of tropical rainforest on the planet. Its watershed is the largest river system in the world, covering 40 percent of the South American continent and carrying 20 percent of the world's flowing fresh water. The rainforest is also the ancestral home of nearly 200 indigenous cultures; people who have demonstrated sophisticated ecological stewardship of their rainforest territories for thousands of years. And the Amazon rainforest -- our climate's regulating heart-pump, key to the fight to stem global climate change -- is in peril, under increasing threats from our global economy's unsustainable demand for finite resources: timber, minerals, hydrocarbons. I am no stranger to the struggles of indigenous people in the Amazon to protect their ancestral territories from the short-sighted and exploitative "development plans" of governments, or from the unchecked greed of the global extractive industry. My husband Sting and I founded the Rainforest Fund 25 years ago, and have worked for decades -- at times with great success, and at times with heartbreaking failure -- in support of indigenous people, such as the Kayapo who live along the legendary Xingu river of the Brazilian Amazon, in their fights for self-determination and protection of their pristine lands. Over the last six years I have been working in Ecuador's northern Amazon, a region of unparalleled biological and cultural diversity that has been decimated by decades of reckless oil extraction. It has been an honor to work in support of, and to learn from, the Cofan, Siona, Secoya, Kichwa and Waorani peoples of the Ecuadorian Amazon on a water project -- www.GiveClearWater.org -- which is building a movement for clean water, cultural survival and rainforest protection. But it would be dishonest for me not to admit that I wish such a project was unnecessary. I wish that history was not so cruel as to demand the need for a project to provide life's basic necessity -- clean water -- to the ancestral guardians of the rainforest. And yet, the region's rivers and streams are today poisoned, necessitating rainwater catchment systems and cultural renewal for these forest guardians, who for millennia relied upon the water flowing through their boundless backyard for drinking, cooking, bathing, and fishing. You may be familiar with the tragic story of oil drilling in northern Ecuador: Chevron (formerly Texaco) deliberately dumped billions of gallons of toxic wastewater and spilled roughly 17 million gallons of oil ("cost-cutting measures") in the rivers and streams of the once-pristine forest. The consequence: a severe public health crisis amongst the indigenous people and farmers of the region. Cancer, birth defects, disease, and poverty for those unlucky enough to live above an American oil company's underground rivers of liquid gold. A lawsuit was filed 20 years ago to hold the American oil company accountable, and in February 2011 Chevron was found guilty of environmental crimes in Ecuador, and was fined $19 billion by Ecuadorian courts. Ecuador's Supreme Court recently upheld the verdict, but cut the damages to $9.5 billion, a figure which would allow for environmental remediation, provision of health care and clean water, and cultural restoration, but removed the punitive damages ordered by the lower courts. And we hoped that was the end of it. That Chevron would recognize its historical wrongs, pay the fine, and pledge to repair the damages that it caused. But instead, it has fought with alarming intensity to evade responsibility. Unfortunately, it seems, corporate impunity is the theme of our days. Chevron has spent hundreds of millions of dollars on lawyers, public relations firms, private investigators in order to impugn the verdict in Ecuador, assault the entire Ecuadorian judicial system, discredit the human rights lawyers, and humiliate the indigenous people and farmers, who are guilty of nothing more than living in the forest and drinking the water poisoned by oil and the byproducts of its excavation. Sting and I had the unfortunate opportunity to spend several days over the many weeks in October and November attending a trial in U.S. federal court in New York, where Chevron accused Steven Donziger, a human rights lawyer and friend of mine, along with the indigenous peoples and farmers of Ecuador, of having a waged a multi-decade racketeering conspiracy against the company. Filed under the RICO statute -- designed originally to prosecute organized crime syndicates -- Chevron's racketeering lawsuit is the oil giant's alarming and cynical attempt to destroy a two decades-long effort to hold the company accountable. And tragically, they have succeeded. It is not my place, nor my expertise, to opine on the legal matters involved. I am nonetheless compelled, principally because of the suffering of humble, dignified people I have witnessed in Ecuador at the hands of an American company, to say that Chevron's legal and public relations tactics in this case constitute a grave injustice. That the affected indigenous peoples and farmers, and the human rights lawyers who have advocated for them, should find themselves in a New York courtroom, accused by its abusers of conspiracy and fraud is a preposterous, humiliating, and distracting sideshow. The victims of a terrible environmental crime have become the guilty parties, and the grave wrongs perpetrated against them are brushed aside, apparently no longer relevant or worthy of note. One should always ask questions in life. Among the greatest and most pressing questions of our time, indeed of all times, must be: What is the nature of justice? And: How can justice be attained? What kind of world are we living in when a farmer from northern Ecuador, Donald Moncayo, a kind and generous man whom I know and admire; who lost family members and friends to the sickness produced by oil contamination; who has worked tirelessly to bring attention to the plight of his community and surrounding communities now stands accused of conspiracy and racketeering only because he has dedicated his life to holding a corporation accountable? What kind of world are we living if it has been shown that only 90 companies are responsible for two-thirds of man-made climate-endangering emissions. And among those, we know that but a few companies -- like Chevron, Exxon and BP -- are primarily responsible for climate change since the dawn of the industrial age, and yet we have made no progress in holding them to account, or forcing them to change course? With a stranglehold on government and resources that frequently dwarf that of the vast majority of nation-states, these companies continue to operate with absolute impunity. These are huge questions. Our shared future depends on asking them, and relentlessly seeking answers. And I suspect that how we confront, and ultimately dismantle, corporate impunity may be the greatest challenge of our time. This morning, U.S. District Judge Lewis Kaplan delivered his ruling in Chevron's retaliatory RICO case against the Ecuadorian villagers living amidst the company's contamination, and their long-time legal advocate Steven Donziger. The release contains brief statements from the three people listed above, as well as an informative background document with additional analysis on the ruling. “With all due respect to the court, this is an appalling decision resulting from of a deeply flawed proceeding that overturns a unanimous ruling by Ecuador’s Supreme Court. We believe Judge Kaplan is wrong on the law and wrong on the facts and that he repeatedly let his implacable hostility toward me, my Ecuadorian clients, and their country infect his view of the case. This decision is full of vitriol, is based on paid evidence from a corrupt former judge, and ignores the overwhelming evidence that Chevron committed environmental crimes and fraud in Ecuador. Through this decision, we now have the spectacle of a Manhattan trial judge purporting to overrule Ecuador’s Supreme Court on questions of Ecuadorian law. All of these factual and legal issues will be addressed in due course on appeal. We are confident we will be fully vindicated in the U.S., as we have been in Ecuador." “While the Ecuadorians respect the rule of law in all countries, they do not accept this court’s jurisdiction nor this ruling. The affected communities long ago gave up hope that a U.S. court would provide them relief from Chevron’s contamination, which has taken their loved ones, poisoned their lands, and imperiled their cultures. Amazon Watch stands with Ecuadorian communities in rejecting a misguided judgment delaying justice for some 30,000 indigenous people and farmers who continue to suffer from the company's toxic legacy in the Amazon rainforest. The decision – handed down today by New York District Court Judge Lewis Kaplan – also underscores the threat that well-financed corporations pose to justice and the rule of law with their ability to spend hundreds of millions of dollars on efforts to attack victims and their allies. Today's verdict is an example of Chevron buying and bullying its way to a verdict with 60 law firms and thousands of legal professionals hell-bent on exhausting the Ecuadorians and their allies. 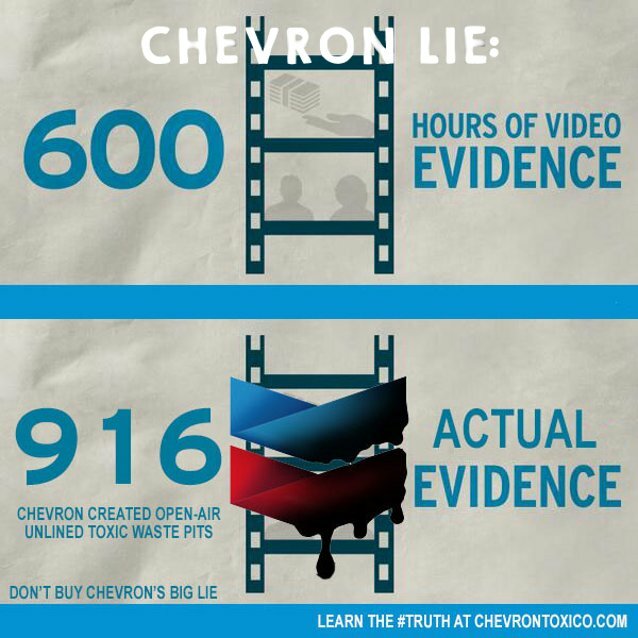 Such a verdict will ultimately prove useless in Chevron's efforts to evade justice.